The Patent Classification System can be a confusing and inaccessible in verbose language. However, the Lens has now enabled exploration based on various patent classification systems; CPC (201802 version), IPC (20180101 version), and USPC (201502 version). These files are usually updated once in a year and we will try to keep them up to date. Classification text viewer: here, you can search within the full text of classification definitions and notes to find the appropriate classification code that encompass your query terms. The Lens does not index yet documents on their section (‘A, B, or H’), class (‘A01 or H01’) or subclass (‘A61K, or H01M’) levels, only at the group level (eg H01M10/00). Moreover, unlike espacenet, in the Lens, we don’t index yet documents based on their parent groups, only on the group/s that they are directly filed in. So when you search for documents in ‘H02K1/00’, The Lens only returns documents filed directly in that group. It does not include any patents filed in subgroups of H02K1/00. If there is a funnel next to a particular classification code, you can view filter the lens with this code and view the list of documents with that code. 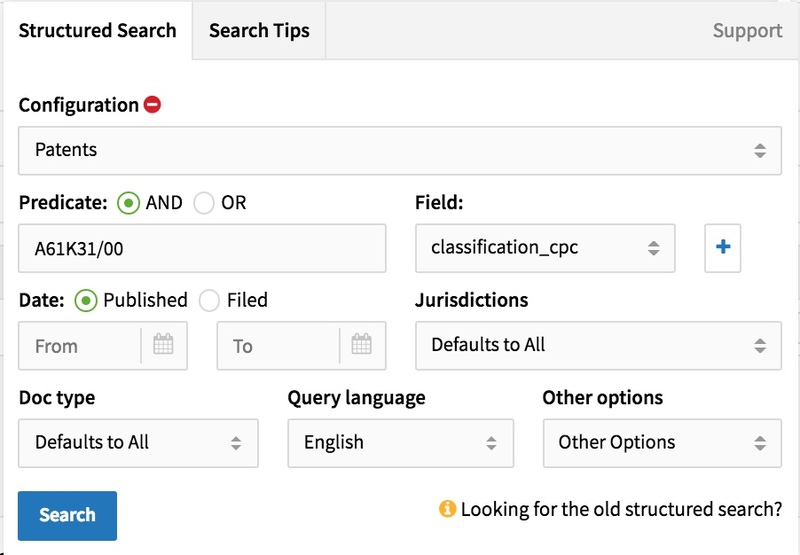 While you may not yet be able to refine that search further, there are other ways that you can search by classification codes or limit your searches by these codes. See the support page at https://support.lens.org/help-resources/basic-help/search-syntax/ for further info and more examples. Another option is to start your search by broad keywords and then browse the resulting classification codes in the search results, and refine your search by a specific classification code. If you click on the ‘i’ next to a classification code, you can view the context and full hierarchical description for that code. We hope any of these approaches will make your Classification searches easier.